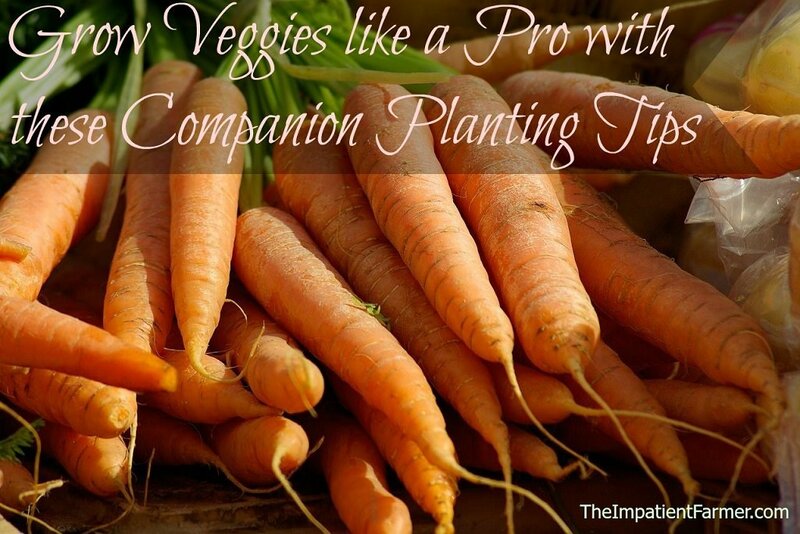 Companion planting is a way to mimic what happens naturally in the garden. If you take a walk through the woods, you will see the wide variety of plants all growing harmoniously with each other. This natural blend of plants grow in accordance with light, soil and moisture and give our forests continual blossoms, leaves and fruits from early spring till fall frosts. Organic gardeners look to achieve this type of harmonization with companion planting. There are many benefits to companion planting in the garden. By growing compatible plants close together you can increase yields, control pests and suppress weeds. An interconnected system of plants, birds, bees, beneficial insects, sun, shade and soil, all working together to deter pests and build a living ecosystem. This is especially useful in the veggie and herb gardens where we try to keep our gardens as natural as possible. Vegetable gardeners have a tendency of growing rows and rows of the same type of crop, creating monoculture plots. We get accustomed to growing large sections of the same vegetables in the same place year after year out of habit. 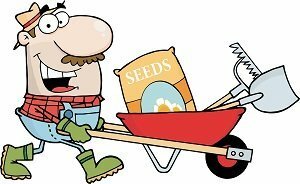 And since they have the same growing conditions, it makes it easier when seeding, weeding, watering & harvesting. While type of planting may fit better into your structured garden planning and the orderly mind, we are actually creating an environment that works in the favor of weeds and problem insects. When the same nutrients are pulled from the soil year after year, it can become unbalanced creating an invitation for pests. This also could lead to requiring the use of insecticides or herbicides to keep these problems in check. Even when you use organic sprays, this is not the ideal setup. You can easily avoid the use of any type of sprays by intercropping compatible plants. 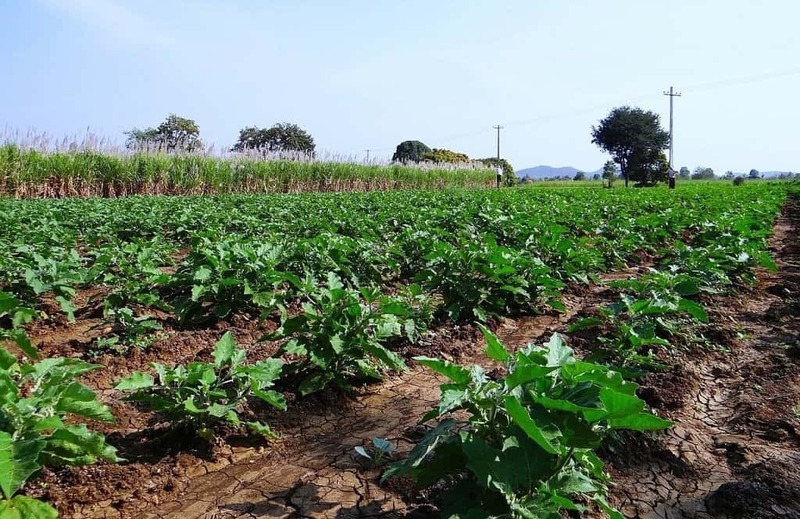 Intercropping or interplanting is the practice of growing alternate types of vegetables in each row. 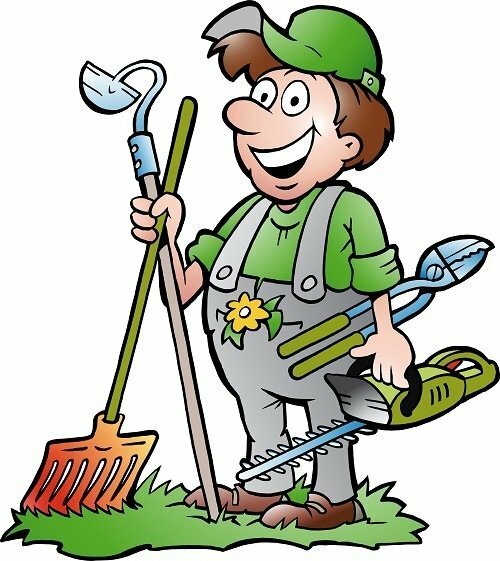 By mixing it up a little, you can actually cut down on the ongoing maintenance tasks of the garden. You may also consider breaking up the single row into three or four smaller plots spread out around the garden. Try growing different companion plants to find out which ones work more favorable with each other. Flowers and herbs do wonders in the vegetable garden. They add color and fragrance, attract beneficial insects and birds, and deter garden pests. Using companion plants for pest control is a great organic way to boost the health of your garden. The most popular flower that is used as a pest deterrent in veggie gardens is the marigold. With its strong pungent odor, marigolds drive away numerous harmful insects and should be planted freely throughout your vegetable garden. However, not all marigolds have the same effect on garden pests. French and Mexican marigolds work the best, while some of the hybrid marigolds do not have the same strong scent which acts as a repellent. 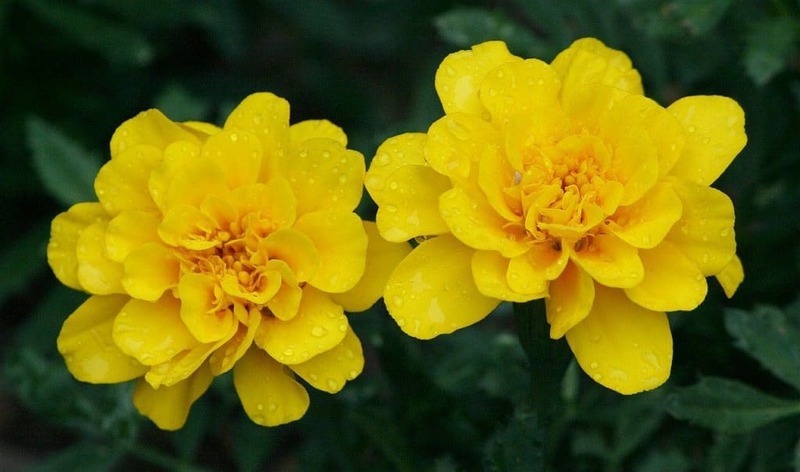 The Mexican Marigolds produce a chemical from their roots which can repel the nematodes (microscopic white worms in the soil) that attack tomatoes and potatoes in your garden. French dwarf marigolds have also shown consistent results. It takes 3-4 months to see results, so plant your marigolds early on in the season to protect your tomatoes. Another favorite flower to plant in the vegetable garden is nasturtiums. 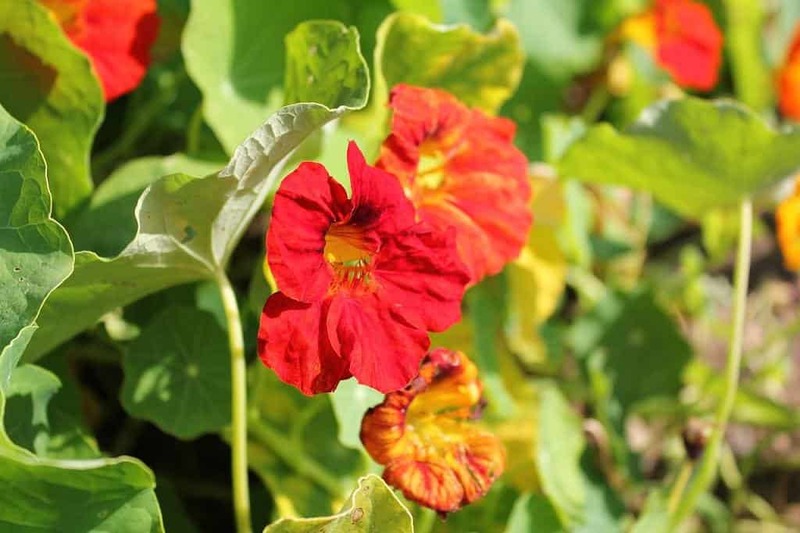 There are many varieties of Nasturtiums from 6 inch dwarf plants to vining types which will twine their way up a trellis or bean pole similar to sweet peas. Not only are nasturtiums edible, but they also help keep aphids, potato bugs, squash bugs, and whiteflies away. They combine well with vine growing vegetables like squash, melons and cucumbers, as they ward off insects that will attack such varieties like the squash beetle. Sweet basil, rosemary and tarragon are three herbs that I plant freely throughout my vegetable garden. Basil is grown to deter aphids and mosquitoes, rosemary to repel the cabbage moth, bean beetles and carrot fly and tarragon for all round use. There are many herbs which can add to the flavor of your vegetables. Here are a few good combinations to grow. Basil is good to grow with tomatoes and peppers. Mint can enhance the flavor of watermelons and cabbage growing nearby. 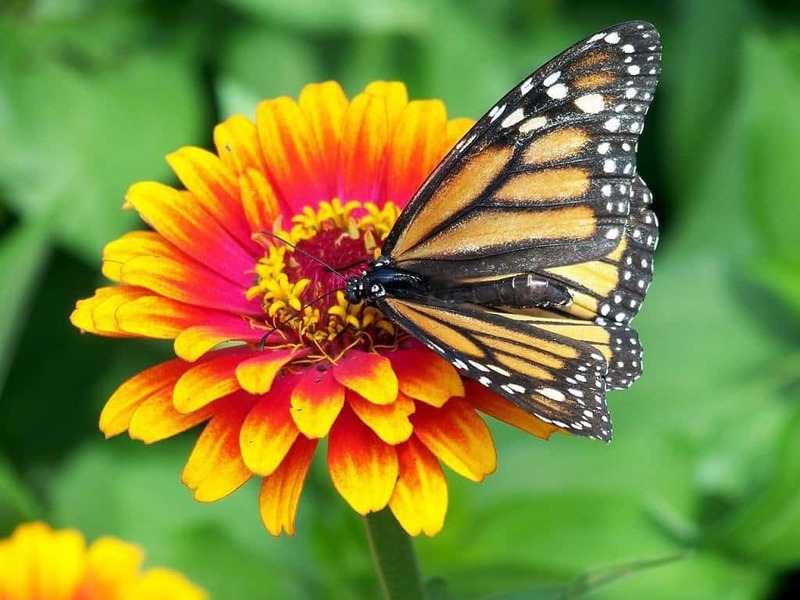 Growing brightly colored flowers like zinnias, sunflowers and Echinacea will help attract bees and butterflies to your vegetable garden. By spreading a mixture of annual flowers in with your vegetables, you will have a colorful garden which is a delight to visit by both people and winged creatures alike. You may also let a few of your herb plants mature and set flower. This is a surefire way to attract more butterflies to your garden as they especially love flowering herbs. Companion planting vegetable varieties that have different root depths is a good idea. This way the plants won’t be competing for the same nutrients in the soil. For example, roots from bush beans or any legumes tend to grow deep into the soil and will actually pull nutrients up to where shallow rooted vegetables (cucumbers for example) can benefit from these same nutrients. Different vegetables require different amounts of fertilizer. They are either classified as heavy feeders and light feeder. If you plant similar feeding types together, it makes your job easier come feeding time. Some examples of heavy feeding vegetables are tomatoes, cabbage, broccoli, squash, eggplant and all leaf vegetables. Light feeding examples are, peppers, carrots, beets, onions, peas and most other root crops. Use this companion planting guide to see what grows well with each vegetable in the garden. Companion planting is a just another aspect of organic gardening that may take a few years of practice to find out what works well for you in your garden. To start with I suggest spreading flowers and herbs throughout the garden. If you grow root vegetables, also try intercropping them with some of the companions listed above. Then experiment with additional combinations as you go. With this simple approach to companion planting, you may never need to spray any of your vegetables at all. And get to enjoy fresh organically grown vegetables all summer long.